Salisbury steak is actually a burger steak . It isn’t new to me and my family, we usually have it with mushroom gravy. What caught my interest to try this recipe was primarily the picture in the magazine, it was very nicely plated and I thought that would be fun to try and besides we never had it (burger steak) with a French onion soup, something I thought I would never try because I used to dislike onion when I was younger. Another reason why I decided to make it was because when I read the recipe- despite the long list of ingredients- it was actually easier than the impression I got from it’s picture. I just lack 2 ingredients, the parsley and spring onion plus I mistakenly added white instead of red but aside from these, I was happy with the outcome, it was really good I especially liked the crunchy cheesy toast the steak was serve on. I tried to copy the plating from the magazine as best as I could, I think I did a pretty good job ( not with the photo, though), if I should say so myself. I didn’t have parsley as I have mentioned so I just used basil instead. Heat one tablespon oil in a saute pan over medium high heat. Add patties and saute 3 minutes on each side or unil browned. Remove from pan. Add onions and sugar to pan; saute 5 minutes. Stir in garlic and tomato paste; saute 1 minute or until paste begins to brown. Sprinkle onions with reserve flour; cook 1 minute. Stir in broth an wine then add salt and thyme. Return meat to pan and bring soup to a boil. Reduce heat to medium-low, cover and simmer 10 minutes. Serve steaks on cheese toasts with onion soup ladled over. Garnish with parsley and parmesan. Preheat oven to 400 degree Celcius. Place bread on a baking sheet. Combine butter, garlic and paprika and spread on one side of each slice of bread. Combine cheeses and sprinkle evenly over butter. Bake until bread is crisp and cheese is bubble, 10-15 minutes. 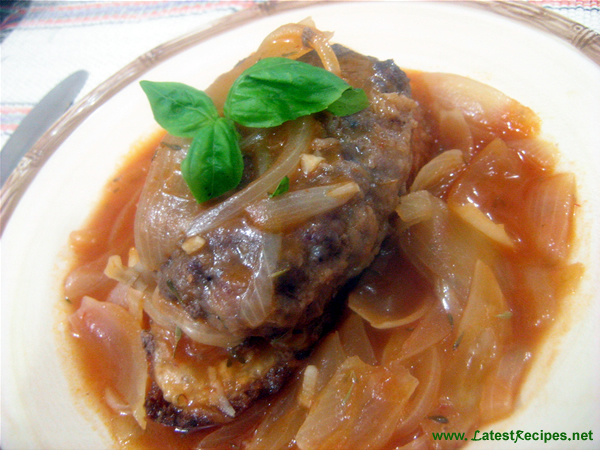 8 Responses to "French Onion Salisbury Steak"
Awesome page. Steaks are my fam’s favorite dinner. Thanks for the info. Keep it up. Thank you for sharing. Looks delicious. Yummy ! Cheers ! Olive, this looks great. We really can’t live without rice but sometimes I can live without it too. I think that’s the joy of cooking, you can always change the recipe. Good luck on the bazaar. What are you going to sell? Does this mean, we’re going to see each other? What an excellent & divine tasty recipe!! I rarely eat steak but this dish looks fab! It looks delicious. It’s like having soup and steak in one dish!